Microsoft’s new Office for iPad apps are very good, and hugely popular. A month after release and Word is still the number one free app in the App Store, with Excel sitting at number 8, and PowerPoint at number 16. 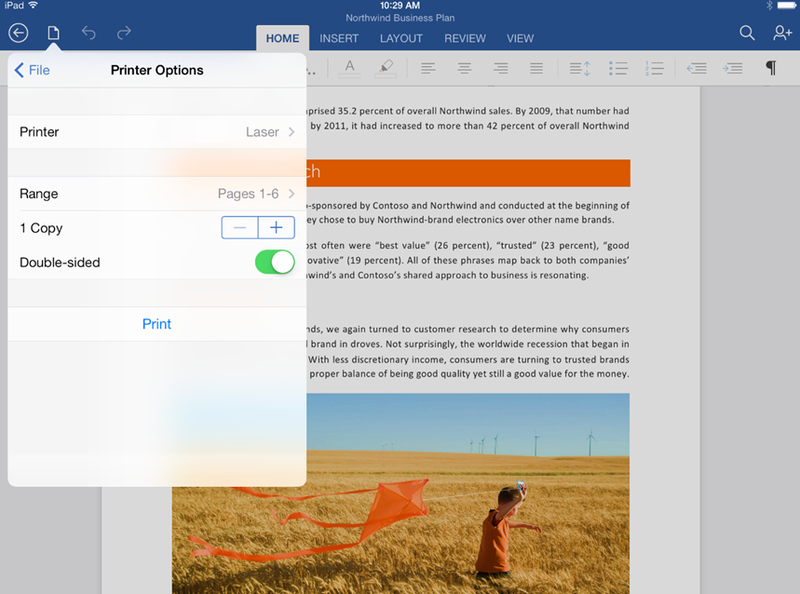 If you own an iPad, and are an Office 365 subscriber, they’re pretty much essential downloads. At launch we were promised additional features were on their way, and today Microsoft introduces the most requested one –- the ability to print Word documents, Excel spreadsheets, and PowerPoint presentations. You’ll need an Office 365 subscription and an AirPrint enabled printer to use the new feature, and can choose to output a Word document with or without markup, and print a single worksheet, an entire spreadsheet or a selected range in Excel. In addition to the new printing functionality, Microsoft is also introducing SmartGuides in PowerPoint, which helps you align pictures, shapes, and textboxes as you move them around on a slide. There’s also a new AutoFit in Excel option, which lets you adjust the width of multiple rows or the height of multiple columns at the same time. The app update also includes a number of bug fixes and stability improvements.